Class IV. Design for ornamenting the Jockey Club Betting Books. These photographs show the application of the design to the colours of the jockey Club. [A smaller design is attached[ Design Class IV. Marcus Ward & Co, Belfast. 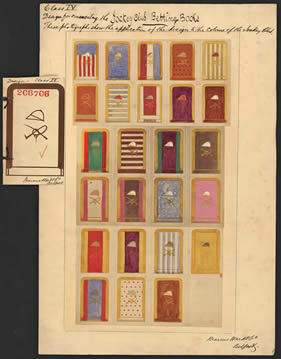 A design for the decoration of betting books 'to the colours of the Jockey Club'. 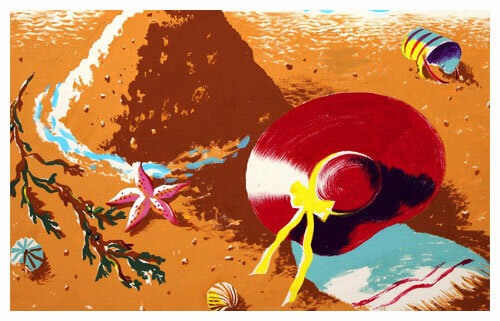 Marcus Ward and Co was a stationery, colour printers and publishing business producing very high quality products. Their London showroom was in Chandos Street, Covent Garden, London. Marcus Ward and Co is particularly noted for producing early Christmas cards and for publishing greeting cards by the designer Kate Greenaway. For a similar design see 208776.